60-foot cone of corrosive (acid) gas, once every 1d4 rounds, damage 20d6 cold, Reflex DC 33 half. The save DC is Constitution-based. Aleister can unsettle foes with its mere presence. The ability takes effect automatically whenever it attacks, charges, or flies overhead. Creatures within a radius of 300 feet are subject to the effect if they have fewer HD than Aleister. 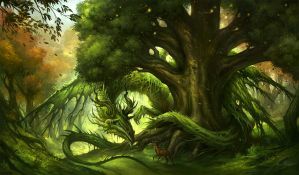 A potentially affected creature that succeeds on a DC 31 Will save remains immune to that dragon’s frightful presence for 24 hours. On a failure, creatures with 4 or less HD become panicked for 4d6 rounds and those with 5 or more HD become shaken for 4d6 rounds. Dragons ignore the frightful presence of other dragons. This special attack allows a flying or jumping Aleister to land on opponents as a standard action, using its whole body to crush them. Crush attacks are effective only against opponents three or more size categories smaller than Aleister (though it can attempt normal overrun or grapple attacks against larger opponents). A crush attack affects as many creatures as can fit under Aleister’s body. Creatures in the affected area must succeed on a DC 33 Reflex save or be pinned, automatically taking bludgeoning damage during the next round unless it moves off them. If Aleister chooses to maintain the pin, treat it as a normal grapple attack. Pinned opponents take damage from the crush each round if they don’t escape. A crush attack deals the indicated damage. This special attack allows Aleister to sweep with its tail as a standard action. The sweep affects a half-circle with a radius of 30 feet, extending from an intersection on the edge of its space in any direction. Creatures within the swept area are affected if they are four or more size categories smaller than Aleister. A tail sweep automatically deals the indicated damage. Affected creatures can attempt DC 33 Reflex saves to take half damage. Aleister can breathe underwater indefinitely and can freely use its breath weapon, spells, and other abilities while submerged. Aleister can pinpoint creatures within a distance of 60 feet. Opponents it can’t actually see still have total concealment against it. Aleister sees four times as well a human in shadowy illumination and twice as well in normal light. It also has darkvision out to 120 feet. NOTE: Aleister is an NPC in the Years of Gold setting, and the entry reflects that. It should be easy enough to adapt to games and campaigns in other settings with only minor cosmetic changes. Where do dreams come from? And where do they go? Such were the thoughts of young Aleister, born in the time when titans fought for control of the world. Haunted by dreams and visions, many of them concerning the coming of a new, terrible time of mourning, Aleister hid from the eyes of the titan-gods in the massive woodlands of Dunas. Aleister proved to be powerful, and fought the many beasts of that forest to survive. It grew older, stronger - and increasingly more evil in heart. Many long years passed before Aleister stepped out of Dunas for the first time: with its magic, it assumed the form of a human alchemist, and traveled Pansaer far and wide. It learned secrets in the east as it schemed and fought with the snake cults; it saw things unseen in the northern wastes, taught by vampire lords and liches of great power; it climbed the tallest peak and dived the deepest depth to grow, not in size and strength, but in wisdom and knowledge: it knew that only through secrets could it grow greater. Finally, the number of its years in the thousands, Aleister returned to Dunas, its home of old. There, it sought out the lair of a pair of green dragons of lesser power and enslaved them with its power. Taking the lair as its own, it began to tyrannize the surrounding woods, enslaving not only the many monster tribes of the forest, but any and all intelligent creatures in the vicinity. Its most diabolical deed was magically entrancing the leader of a small Midland village with dominate person, creating itself a continual supply of human meat. Now the Green Devil hungers for more: the visions of its early years still haunt it, and even though they are much rarer nowadays, it still wakes up now and again in cold sweat, with images of eternal mourning lingering before its eyes. Its hunt for answers has taken it to the most powerful diviners in Pansaer, but now it seeks counsel from the greatest prophet of all the lands: Jonathaiah, the grand master of divination magic in the Spire. To this day, Aleister has yet to find a way to enter the Spire, let alone reach the third level, and it concentrates nearly all of its efforts and willpower towards that old school of magic. This is not to say that its interests are unilateral: its schemes are greater than those of any other, and reach to even the most remote locales of Pansaer. Currently, its attention is drawn towards Tull, which houses the path to the tower. The west interests it the least, since they are the grounds of younger races (such as man), and have few great secrets to uncover. Aleister's attention is directed to the east, but it takes great delight in meddling with the nobility of Pansaer: it constantly plays a game of noble chess with the royalty, usually through its followers. In its dragon form, Aleister resembles an average green dragon: emerald green scales, powerful lizard-like body and a crooked posture. Aleister is a little smaller and more wiry than its kinsmen, but every bit as strong, and ten times as cunning. Its eyes gleam with an off-putting intellect and desire, and it prefers to speak Or, considering it the noblest of languages - those few adventurers who can speak it are in a better position than those who don't. Aleister has no spell or special ability to take a human form; thus, it uses a powerful artifact called the Mirror of True Lies to alter its appearance to that of a human alchemist. This form easily explains the smell of chlorine and other chemicals that linger on it even in its alternate form. When in human form, Aleister resembles a middle-aged man with green eyes, pointy black beard and a soft voice. Its thin frame holds over seamlessly to its human form, and it appears somewhat famished, and even feral, especially if it so wishes. Aleister despises the titan pantheon, and while it is far too intelligent to ever openly mock them, it considers their followers simple-minded and fanatical. The only power it trusts is that of dreams; suffering from prophetical visions itself, it finds it hard to disregard the truth that lies in prophecies and visions. The powers that be in it allow it to blast its enemies with the horrors of its dreams with phantasmal killer: this is one of its most dangerous ability. The Green Devil is wary of traitors and incompetent lackeys, and thus lets few people close to it. Most of its underlings have never seen it, or in some cases even heard of it; it rules from behind the curtains. It is at the very top of a complex pyramid of command, the lowest of which are its monstrous slaves. These are ruled by their respective chieftains, which in turn are commanded by sub-generals (often sorcerers of note, mostly humans and reptilian creatures, such as lizardfolk). Just below it are the mightiest of its servants, each of which is a force to be reckoned with on its own. The two generals of Aleister are Grymm and Lochh, twin green dragons. They are much younger than Aleister, and compared to it, not too bright (which suits Aleister just fine). Their magical powers are lesser than their master's, and Aleister is very careful not to let them overcome it in power or in the trust of its underlings. Long has Aleister sought entrance to the Spire, and at long last its quest is nearing its end. The greedy dragon has learned of a secret catacomb complex beneath Irid, built long before the construction of the city. The complex, built by wizards of high status as a place of eternal rest (be it preserved with magic or in undead form), contains the last recorded information from the Spire. Perhaps a way of entering is still kept there? As always, Aleister amuses itself with the nobility in the west. The game is not going well for it, however: Lucas Hayworth, the grim sheriff of Basket area, has begun a great crackdown on noble crime in Redford and surroundings, and many of Aleister's pawns have been imprisoned or killed. The Green Devil now bears ire (however petty) against the sheriff, and would rather see him dead than let him continue his antics. Some of the higher-up nobles, such as the von Gutherbergs, are puppeteered by Aleister, and it's planning on taking the sheriff out with these figures: a more interesting fashion of destroying its enemy than just dealing with him through personal force. Aleister has no love for combat, but when it deems it necessary (or in those rare occasions when someone has to power to actually threaten it) it is a powerhouse. Aleister would rather use the massive arcane might it wields than the equally threatening physical force it possesses, and thus usually begins fights with its breath weapon and a plethora of spells, especially cloudkill and waves of fatigue. Thanks to its incredibly wit, sharp planning and network of spies and other minions, Aleister almost invariably has knowledge of any threat to itself, and has its defenses (globe of invulnerability, haste and mirror image) up when the fight starts. It uses summon monster VI to summon a fiendish giant constrictor snake to take out an opposing spellcaster, then wastes foes with black tentacles, wall of fire and cone of cold. Weaker damage spells, such as lightning bolt and scorching ray, are often empowered or quickened. Aleister's quickened dominate person allows it to cast the spell-like ability for free each turn, which it gleefully does, especially if it wants to toy with its foes before finishing them. When finally moved to melee, it uses crush and tail sweep much rather than actually concentrating on attacks; when it does, bite is the main threat to its enemies. There are few who could force the dragon to flee, and thus it rarely does. Constrict (Ex): On a successful grapple check, a constrictor snake deals 1d8+10 points of damage. Smite (Ex): Once per day, a fiendish constrictor snake can make a normal melee attack to deal 11 extra damage.